A collection of nifty wine and travel bits from around the interwebs. 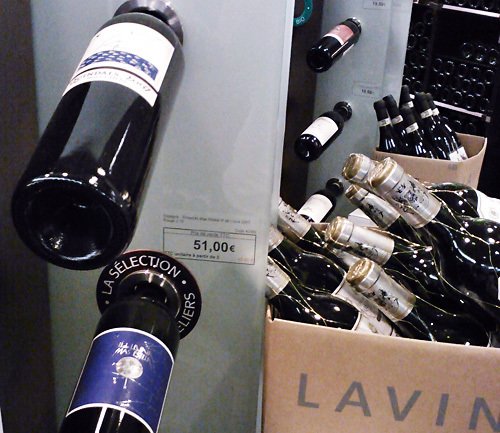 Paris Pricing Insanity On our recent trip up to Paris, we found the murder the they get away with on wine prices with the above two wines from Mas Estela in DO Empordà at 16.50€ and 51€ whereas in Barcelona they’re 9.95€ and 23.95€. Paris by Mouth “Our guide to Paris wine bars” is a mighty useful reference to the wine bars around Paris, especially if you’re going to Paris like we did recently. Speaking French may or may not be optional, but it sure won’t hurt other than the fact that speaking French twists the Anglophone mouth in to a burnt croissant. David Lebovitz “Pith Helmet” is a tasty cocktail for those blustery summer days in Paris which we know well. He even made his own bitters for this tipple, which makes it triply impressive. Vinologue “Dalmatia 4th edition released” is shameless promotion, but again, we’re fighting an uphill battle in making sure that know this is about delicious, coastal wine and not spotted dogs. Seems to be working. Pick up a copy to find out for yourself. Wine Enthusiast “Tasting Galicia’s Glory” digs in to the tasty business being made from the grape in Galicia, that northwest chunk of Spain, which, for the geographically impaired Amercians who assume that every region in Spain borders Basque Country, it doesn’t. Tim Atkin “The Swartland Revolution” shows Tim’s great appreciation for one of South Africa’s lesser known wine regions that from all accounts (winemakers we talked to in Stellenbosch raved about it too) is producing wonderful wines. Alice Feiring “Spray and go–or no go So2” gives a truly wholesome WTF moment with this “wine preserver” which makes us wonder what the hell you’re doing wrong if you can’t finish a glass of wine. The Drinks Business “Whisky fans create new Glenmorangie style” brings word of the stalwart distillery pursuing more involvement from its fans, including naming a new whiskey. Undoubtedly, “I love Scotch, Scotchie, Scotchie Scotch” will probably be rejected due to copyright issues and common sense. CNN “Top summer food destinations” joins on the “Croatia Safe Now” bandwagon and gives a nod to the food adventures awaiting in Istria–for those who still waiting for our guide to come about. El País “El consumo de vino en España desciende un 0,9% y se sitúa en mínimos históricos” brings up that fact that wine consumption in Spain continues to fall despite that fact that everywhere you step, you seem to stumble upon a vineyard. BBC Travel “The Cronut spawns in London” talks about all the hybrid dessert insanity coming about in the UK because those fatbergs didn’t come from nowhere. Naturally, we’d just like to see traditional desserts made a helluva lot better and skip the “Townie”.